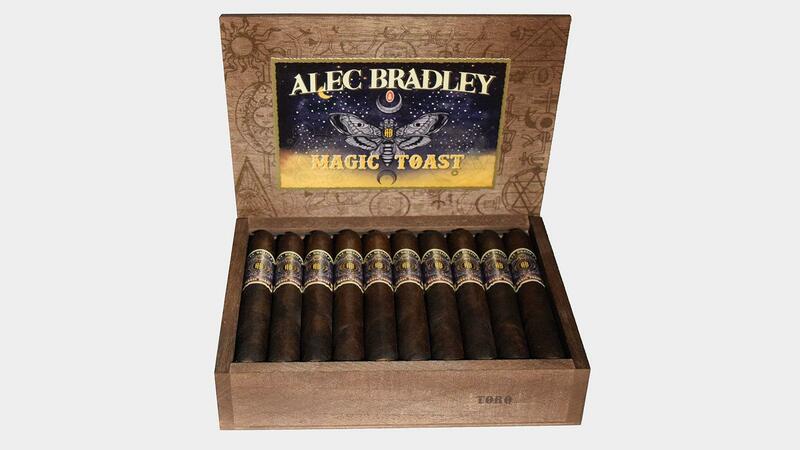 Cigar smokers intrigued by the mysterious rollout of Alec Bradley’s Magic Toast brand will soon get a taste of the new cigar. The Honduran-made smoke, which was teased and then unveiled at last Summer’s IPCPR trade show in Las Vegas, will begin shipping to tobacconists this week. Magic Toast was rolled with a Honduran wrapper over two binder leafs from Nicaragua and Honduras. The filler tobacco was also grown in Nicaragua and Honduras. The cigars come in three sizes: Robusto, at 5 inches by 52 ring gauge ($8.95); Toro, at 6 by 52 ($9.50); and Gordo, 6 by 60 ($10.25). According to Alec Bradley owner Alan Rubin, Magic Toast is a medium- to full-bodied smoke with a slight, natural sweetness. The new brand was made at the Fabrica de Tabacos Raices Cubanas in Danlí, Honduras, where many Alec Bradley cigars are produced.